…as you can see from this great photo snapped by site supervisor Erwin. With the summer-like temperatures and nice breeze, we here in the office are a little jealous. 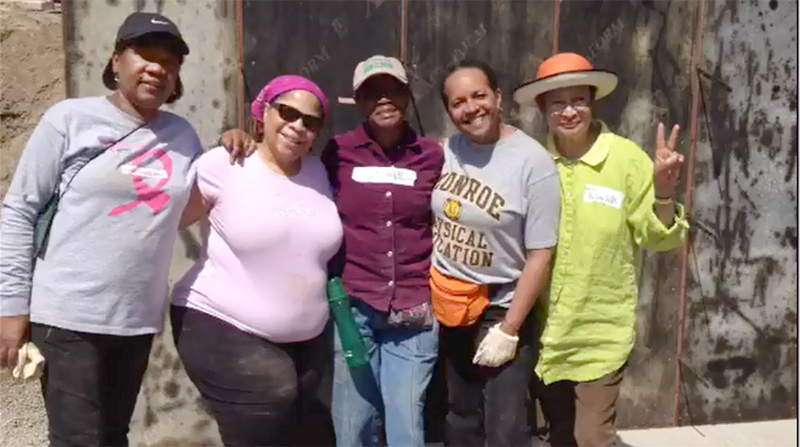 It’s a great day to be building and the ladies from The Links, Inc. have definitely kept the Women Build house moving forward – look at those foundation walls behind the Links women! If you’re on a Women Build team, don’t forget to sign up for your volunteer days! We need EVERYONE in the system – not just the team captain – so that we know who’s out on site each day for achievement badges, how many lunches to order, and who hasn’t yet built. Women Build site days are running out, so make sure to jump on Volunteer Up and grab your spot today even if you haven’t finished fundraising. If you have any questions on how to sign up, give Tiffany Paine a call at 546-1470 ext. 315 or email tpaine@rochesterhabitat.org. And one last fun piece of Women Build news – all of the photos from the Ground Breaking are available on both Flickr and Facebook. Don’t forget to upload yours all well and add them to the Flickr Pool or tag Flower City Habitat in them! This entry was posted in Team Progress by flowercityhabitat. Bookmark the permalink.